This page is designed to help guide you through your beginner stages with as little headache as possible. We’ve crowd sourced a bunch of tips that we wish we had been told when we joined the hobby. Some of the tips on this page involve spending a bit more money for quality equipment, but the point is that these items will continue to be useful as you progress in the hobby. One last bit of advice before getting into the content of this page. Learning to homebrew is an iterative process. Everyone makes mistakes, especially as they are learning. Don’t stress too hard about the little things, in the end you’ll likely end up making beer! Don’t let yourself become discouraged if your first few batches don’t measure up to your favourite commercial beer. As long as you learn from your mistakes you will end up making beer as good as, if not better, than most commercial craft beer. Please shop at our Local Homebrew Shops (LHBS) for the items mentioned below. They do lots to support the local homebrew community and will be able to answer any questions you have. Note: We recommend buying the physical book because 4th edition is much updated compared to 1st edition freely available at howtobrew.com. Edit 2017: The 4th edition is now released, and it’s even better! Start with Extract or All-Grain? Most homebrewers brew their beer using an all-grain method, however this is a bit more advanced than using extract. We recommend that beginners start with the extract+specialty grains method then transition into all-grain when they feel ready. The reason for this recommendation is because we feel that the time of a new brewer is better spent learning about quality fermentation and yeast than mashing and all-grain brewing. An extract brewer that focuses on quality fermentation will make better beer than an all-grain brewer that neglects their fermentation. The length of this extract step doesn’t have to be longer than 1 or 2 batches, and if you follow our equipment recommendations below you can transition into all-grain brewing for under $20. The rest of this guide is written with extract+specialty grains in mind. Read more about our recommended progression for in the last section at the bottom of this guide for our advice on how to progress to all-grain. While we recommend staring with extract, we realize that there are some people that are especially passionate, willing to take more risks, feel they can learn about both all-grain and fermentation at the same time, and don’t want to follow our recommended progression. To those people we recommend checking out the Brew In A Bag (BIAB) method. Note: All units are in US gallons since that is how most beginner books are written. 1, 2.5, or 5 gallons? Which size batch should I make? This depends largely on how much space you have where you live, how much beer you want to produce, and how much experimentation you want to do. Someone living in a condo or apartment without the ability to set up a propane burner may be limited to brewing on their stove top. Someone living at a house with access to outdoor space may have the freedom to set up a propane burner enabling you to do 5 gallon batches. There are creative way to get around these limitations. Some people manage to boil their 5 gallon batches on kitchen stove tops, but in general 2.5 gallons is the recommended upper range batch size for a stove top. Stove top and propane burner aren’t the only ways to boil wort, but they are the most common. Electric brewing setups can help you get around these limitations but tend to be more expensive than most beginners are interested in. This section will lay out everything needed to brew your first batch of beer. There are a lot of starter kits available out there, but most of them sacrifice the functionality/quality of one or more items to keep the cost down for consumers. However, they are usually still a good value compared to buying every individual item at full retail cost. We recommend buying a starter kit and strategically upgrading the cheaper items to match the list below. Most starter kits don’t come with a brew pot (kettle) so we have included recommendations for those. Most starter kits come with a liquid alcohol thermometer. These types of thermometers are almost impossible to read accurately since they are slow to change, we recommend upgrading to digital immediately. We’ve also included a few higher end alternatives to give you an idea what items most long time homebrewers are using. You can elect to upgrade to these items now based on your budget and level of passion for the hobby, and your desire to avoid having to replace certain items after your first few batches. Note: Alcohol-based thermometers are too slow to respond to be useful in brewing. Many starter kits come with them, please avoid using them. Avoid the cheaper victoria mill, it won’t be ideal for all-grain brewing later since it shreds the husks much more than 2 roller mills. Here are some quick and somewhat simple tips. These are things that we wish we had been told when we were beginner brewers. Use the lightest coloured extract you can buy when brewing extract based beers. Instead, use specialty malts for colour/flavour adjustment instead of extract. Hold back some of the extract to be added later in the boil for less colour. Wild yeast infections can easily ruin the flavour of your beer. Fill a spray bottle with StarSan solution and use that to help sanitize awkward items that are hard to dip in a bucket. Sanitize anything that touches the wort after it starts cooling. Don’t bother to sanitize your mash paddle, BIAB bag, or inside of your boil kettle. Track your fermentation temperature closely and make efforts to keep it on the lower end of the range (research “Swamp Cooler” or “Water Bath” methods). Invest in an automated cooled/heated fermentation control chamber as soon as possible. Stick with dry yeast until you are ready to make yeast starters and use pitching rate calculators. Be sure to rehydrate dry yeast before pitching it. Protect your fermenting carboy against light to avoid skunking. Collect used brown pry-off bottles to re-use for homebrewing. De-label and clean by soaking in a tub of PBW or Oxyclean. Avoid twist off bottles since they don’t seal as well and are prone to chipping. Note: Measure the volumes at the same temperature since water expands as it gets hot. On the road to better beer it is tempting to skip certain steps to buy something cool instead of what will get you better beer. You are welcome to ignore the following advice but we recommend you follow this upgrade/progression order to achieve better beer, faster and, with less equipment investment. This is the recommended starting point for a beginner brewer. This allows you to focus on learning about fermentation instead of mashing science. Most new brewers eventually move on to all-grain, but it’s still a good idea to start with extract. Once you have decided that you want to continue in the hobby after your first few batches of extract, it’s tempting to want to build a mash tun and jump into all grain. Before you do that we recommend that you invest in temperature control for your fermentation. This will set you up to brew many more styles of beer successfully. There are lots of way to accomplish this, we recommend a cheap fridge/freezer plus STC-1000 controller. There are cheaper ways like a cold water bath, but they are more inconsistent and harder to control. An extract brewer that focuses on quality fermentation will make better beer than an all-grain brewery that neglects their fermentation. 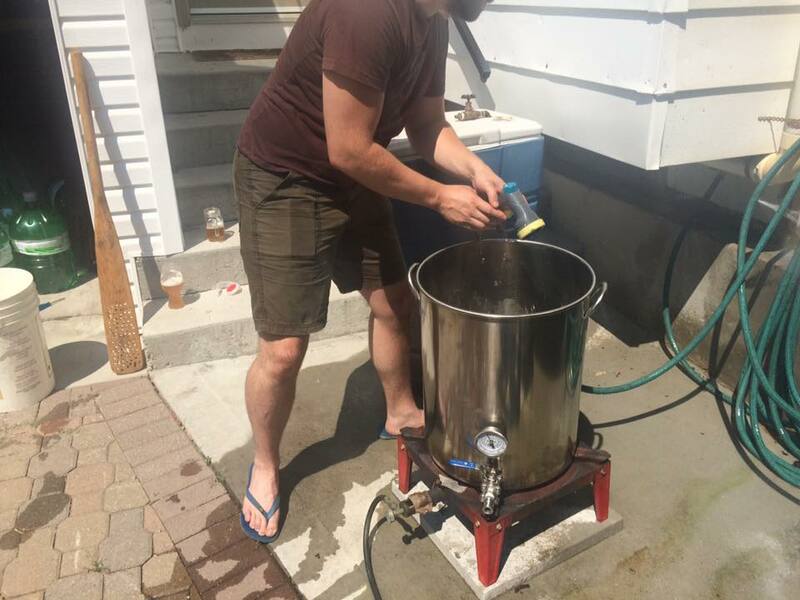 Most homebrewers these days brew using one of several available all grain methods. This guide doesn’t cover all-grain brewing in depth but we recommend either BIAB or Batch Sparging for a beginner brewer. Both are very good and simple methods. There are thousands of places to learn about all-grain brewing so we won’t go into depth here, check out our Recommended Resources above if you want recommendations on where to learn. Hopefully we will publish a similar post in the future for the more advanced homebrewer with all-grain in mind. From all grain brewing it’s tempting to skip this step and go right to kegging. However, more and more it is becoming apparent that mash pH and water mineral profile are two of the most important things to great tasting beer. For just over $100 you can get a solid pH meter, and all the chemicals you need to get started. Much cheaper than kegging! Visit Bru’n Water Knowledge page to learn about water adjustment. By now you are probably sick of having all that sediment in your beer from bottle conditioning. Kegging is a great way to simplify your packaging day and save time by only filling one big container, instead of dozens of little ones (bottles). Kegging is also great at increasing the shelf life of your beer because you can avoid oxygen more easily and keep your beer cold in storage.